Okay, we didn’t average 38 miles per gallon, but we did average nearly 35 mpg in mixed driving with the air conditioning on full and a family onboard for a 180-mile trek. What can we say but amassing. And, we might add, this is all due to the continuously variable transmission (CVT). Don’t order an Audi without trying this option. It takes the perky, turbocharged 2.0 four-cylinder engine and calms it down, especially in traffic. Of course, it has its quirks as it does not really like to leave a stop under light acceleration, but that just might have been the test car. On the road acceleration is linear being that the transmission does not shift like a convention automatic. Add to that the optional paddle shifts that allow you to control the transmission when the need arises and you have a car for all seasons, albeit without all wheel drive. You can also order the six cylinder 3.2 engine with the CVT, too, but there was more than enough poke from the smaller motor for us with 200 horsepower continually on tap. Mom’s view: We had the S handling package and it was okay for smooth highways, but too stiff for roughened roads. If you want to go around corners fast it might be fine, but you are going to pay the price in daily driving. The seats were above average in comfort and the interior was quite nice and the night lighting exceptional inside and out. In the past I have been critical of Audis with the turbocharged four cylinder and automatic transmission as they were jerky in bumper to bumper traffic as the boost would come on suddenly and at the same time the car would downshift resulting in way too much go for moving slowly. The CVT makes this a mute case. Indeed, I wouldn’t buy an Audi without this transmission unless I wanted all wheel drive. As for the 3.2 liter V6 optional engine with its 255 horsepower, it simply provides more torque with little extra acceleration in real time driving situations. Cargo wise the Audi is a bit on the thin side, but provides useful room for four and adequate luggage room. There are ample storage areas, but the cupholders need to be deeper for a car so dedicated to sporty driving. Standard equipment includes dual-zone automatic climate control, power driver seat, and a six-CD changer. Safety wise this Audi has Electronic Brakeforce Distribution, BrakeAssist and stability control, front airbags and side curtain airbags. Crash scores are above average. Dad’s view: Priced right, this sedan offers you a little frolic as well as a heavy dose of frugality as it combines sporty aspects and common sense amenities as well as some controversial items such as a dent me front grill. Options extend from the S-line sport suspension to satellite radio to a cold weather package, HID headlights, auto-dimming mirrors and a navigation system. Driving the Audi requires a little practice as the brakes have a soft feel until you get serious and after that it is all business from the ABS four-wheel discs. The turbo does have a bit of lag, but it really doesn’t make much difference as the CVT transmission smoothes it all over. It feels for all the world like a jet plane taking off, as the acceleration is linear and consistent for such a long period of time. A good vehicle for family travel and commuting. Easily better than any BMW for mileage and ride quality. College going male’s view: There are lots of little things to like about the Audi, which I seriously believe is going to replace the BMW as the car of choice for drivers. Although the Audi needed premium fuel the gas mileage was superior. The dash gauges were very easy to read and stylish. I didn’t like the position of the handbrake near the center armrest. It makes getting to it difficult with gloves on and if you are wearing a large ring. The climate control is overly complex and there isn’t a turbo boost gauge, which is strange. The cup holder placement needs a rethink, too. This Audi is the best Audi. It isn’t too small or too large, is easy to park, gets positive attention, and is less demanding than the competition. The price may be a little too dear for some and resale is not in the same category as BMW, but I expect that to change. 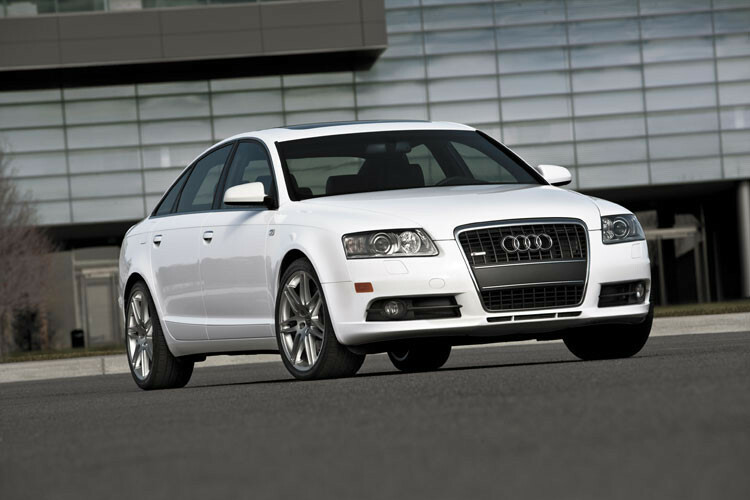 Family conference: The A4 comes as a sedan, convertible, and wagon and can even be ordered with hotted-up options. It is not the handler of the BMW, but it is more comfortable and except for the stereo it has a first rate interior. Easy to live with and the best Audi 4 ever once the manufacture figures out why it stumbles at time when starting out. The Hyundai Sonata has little road feel, is fairly quiet, offers good acceleration, and is priced between $18,000 and $22,000 placing it ten percent less than its competitors while offering more features. You have two engine choices, a four cylinder that produces 162 horsepower and a V6 with 235 horsepower. The engines are quite peppy and unless you crave attention, the four cylinder is quite sufficient. We would strongly suggest that you drive a Sonata with both motors before making up your mind. For 2006 the Sonata is longer and roomier with more leg space, cargo capacity and height than the previous model. Safety wise the Sonata has traction and stability control, antilock 4-wheel disc brakes, front side airbags, and head-protecting curtain side airbags. All models come with a 5-year/60,000-mile bumper-to-bumper warranty and a 10-year/100,000-mile powertrain warranty. Mom’s view: A totally Stepford vehicle. It blends in nicely, never raises a hand to its occupants, and is content with its lot in life. Its peppy engine delivers about 23 mpg in mixed driving and my only irritant was the Sonata’s emergency maneuvering ability and the way Hyundai has made the accelerator sensitive to initial input. The Hyundai’s gauges are easily readable in all lighting situations, the seats aren’t bad, and there is enough storage room to make you happy even if you have active children and a carry-on sized purse. The glove box is more than adequate and the Sonata has a small center armrest console with two compartments. I found the seating position above average as it gives you an excellent view of the road and the tilt and telescoping steering wheel made it easy for a shorter driver to get comfortable. Another factor that made it pleasurable to drive was the wide and low door opening that doesn’t catch your high heels. Dad’s view: Hyundai has become a safety leader as they provide every buyer with standard front side-impact and two-row side-curtain airbags, ABS, electronic stability control, traction control, and active headrests. If they can do that and make a profit why can’t the others? The Sonata is frisky, in need of more handling refinement, and capable of going close to 400 miles before refueling with either engine. I liked the four cylinder better as it was easier to modulate and you get a couple miles more per gallon. Besides, when you are stuck on the 405 or 210, which is pretty much every day, the extra power from the V6 is wasted. Working woman’s view: You immediately notice that there is plenty of room inside and that includes a 16.3 cu. ft. trunk, although it has a high liftover. The turning radius is a tight 35.8 ft. so you have all the ingredients that should appeal to those who are not prejudice against a good deal. The warranty, room, and ability to blend in make it of interest to those of us girls who work in downtown areas and don’t crave attention, but love loyalty. College going male’s view: This is a sweet, not unattractive, companion that just might be worth a second date. There is plenty of room for whatnot and the rear seats fold down in a 60/40 split to lug larger loads. I sort of liked its looks, but too frilly on the road. Traveling with a Dog : You can take the Mastiff out of the city, but you better make a stop in the country. Guilt, thy name is a dog not taken on a family vacation. The evidence is overwhelming as research shows that 98 percent of animal owners call to ask about their pet and 26 percent actually talk to the dog. Further evidence of the guilt brought by such ventures is the fact that 65 percent of owners bring a gift home for their pet. According to a survey done for Starwoods Hotels 40 percent of people think their dog is sad when they travel and nearly 80 percent consider their dog a family member and feel that the canine should enjoy holidays, too. If you need more proof, how about that fact that despite an abundance of dog sitters, good kennels, and relatives, 30 million Americans take their dog with them on trips of 50 miles or more with the majority riding in vehicles while others travel on plans and ships. Even the Queen Elizabeth 2 has dog kennels. Of course, the really great fun of the trip was to check out the route of the nation’s largest dog parade, Santa Barbara’s Annual Big Dog Canine Festival, which is scheduled for June 3. And, obviously since we had a big dog it was a great excuse. To prepare for this epic journey we had to get Charlene, our Mastiff, ready. In this country that can be done with a little bribery such as a dog cookie or golfing trip to the Caribbean. We choose the cookie route. Of course she refused to cookie, but having raised two children we knew what would work from experience. I pushed her to the car while my wife sat inside pretending to eat the dog cookie. Charlene could not resist and fell into our trap. We quickly introduced her to the tether that was attached to the van’s safety belt. This is a must as it allows for some freedom, but prevented her from being a missile in an accident or jumping out. Scientists have found that an unsecured object in a car travels at over twice the speed and force of the vehicle that was hit meaning that even a 20 pound unsecured dog could be moving at well over 50 miles per hour doing damage to all concerned. In addition, a dog that escapes after an accident can run away due to stress or run into traffic. In other cases they can prevent medical personnel doing their job. Although many dogs enjoy having their heads out of the window this is not a good idea since the wind can dry out their eyes and foreign objects can inflect serious injury on them. Just check out the front of your hood for evidence of that or follow a gravel truck. Since the dog is going to be in a new place there is a need to have good identification in the form of an implanted microchip or your cell phone number attached to the collar. Other things to consider are having the dog’s claws clipped, checking the vaccination records, and even a dog booster seat. Make sure that the dog is wearing a flat collar rather than a choke chain in the car and take the animal on a long walk before departing. If your dog suddenly is restless or heavily drooling they may be getting carsick so pull safely off the road and let them out. We had a resealable plastic container with paper towels, disinfectant, medication, cookies, a favorite smelly blanket, and several hundred-dog toy remnants. Since our dog was well trained to wait for our command before leaving the car we didn’t foresee any problems. Wrong. She simply didn’t want to leave the car. Having raised two children moderately successfully, they both are living on their own but apparently wash machines are illegal in their communities and driving several hours to use ours is their only alternative, we resorted to what worked for the kids. My wife pulled and I pushed and Charlene popped out of the van after a 15-minute labor. Before we settled in for the night we enjoyed a long walk the dog nagged us into and fell asleep exhausted. Even the gentle snoring of Charlene was reassuring and we never worried about someone breaking into the room knowing that a dog the size of a Mastiff can trip anyone. Here are some places to take your fiddo and listings worth checking out if you decide to venture to Ventura or elsewhere in the United States. Pet friendly accommodations by destination city and along the way. It is an oxymoron when you write about fuel efficient SUVs. They are just not built to be economical to operate. They push more wind, have greater weight, and frequently have less efficient engines because they don’t have to meet the same economy standards as other vehicles. However, there are a few that provide better gas mileage and still offer the attributes of a SUV. Before we start please note that Saturn, Ford and Toyota have hybrid SUVs that give well over 26 mpg in mixed driving and more into town. . If you really want the best fuel mileage and like the Saturn Green Line, Ford Escape, Lexus RX, or Toyota Highlander they are the best in this regard. The new General Motors hybrid SUVs are very, very expensive, costing several thousand dollars more than the gas only version. How these vehicles earned any Green awards is beyond us. It is much better to get the very good GMC Acadia unless you need to tow on a daily or weekly basis. And, don’t forget the upkeep of those new hybrids in terms of replacing the battery packs and the extra maintenance costs. With gas prices heading upward almost daily and both the safety and insurance concerns with owning a large SUV it only makes sense to consider one if you need the extra towing capacity. BEWARE. The Hummer, Hummer H2, Lincoln Navigator, and Ford Excursion all weigh over 6000 pounds and are illegal to drive on many residential streets and some older highways such as the Pasadena Freeway in Los Angeles. Before you even consider one of these fast depreciating vehicles check your community’s weight restrictions. You might also be interested in knowing that The Car Family was the only group that selected the Toyota Prius as the outstanding car both the year it came out and this year. We believe strongly in economical, family friendly vehicles. We can’t tell you about the latest Ferrari or V10 powered two-seater pick-up truck, but we have reviewed every station wagon. Sports utility vehicles come in three varieties. Those built on a passenger car platform such as the Toyota Highlander. Those built on a truck chassis such as the Ford Excursion. And, those built on a dedicated frame such as the Land Rover, Range Rover vehicles. They also vary in size so it is only going to be natural that the lighter, smaller sedan based SUVs are going to go further on a gallon of gas. Furthermore, those SUVs powered by four cylinder engines are going to rank higher. Perhaps the biggest surprise is that the all wheel drive Subaru Forester ranks nearly as high in fuel mileage as the front wheel drive only competition. This makes it a best buy and we highly recommend it if you need the traction. All of these SUVs should provide you with nearly 25 miles per gallon on the highway or better. Following the high mileage Subaru in the four-wheel drive category are the Honda CR-X and Toyota RAV4. Of these we adore the Subaru most and, if equipped with the optional turbocharged engine and a manual transmission it is a joy to drive anywhere. Don’t overlook this vehicle or its sister, the Subaru Baja with its small pick-up bed, but beware of fast depreciation. By they way check out my open source servers and computers built to your specifications at http://www.eracks.com You might note that I owned a Subaru for several years and found them very reliable, but the cost of parts and upkeep were extremely high. Another surprise is how efficient our favorite SUV is with the two-wheel drive. That is the improved Lexus RX 330 that gets nearly 24 mpg in mixed driving. The luxury competition simply cannot match this worthy vehicle and when the hybrid version comes out you can expect even higher demand. Not as expensive, and a relative bargain as its priced under $20,000 is the Hyundai Santa Fe. We like this car when equipped with the 3.5 engine. However, the best gas mileage only comes with the four-cylinder engine. We doubt you are going to like this combination if you haul a family around. A good new car to consider, and one of our recommendations, is the new Chevrolet Equinox. We averaged 22 mpg on regular and were impressed by its space and utility. Don’t pass this one by if you need a smaller SUV that runs under $25,000. Moving down to the 20 mpg overall average range you get the trim Jeep Liberty/Cherokee 4WD and the new BMW X3. From there on down the mileage figures drop dramatically. On the bottom on the list are the luxurious Mercedes-Benz G500 and Land Rovers that barely crack 14 mpg. They are not alone at this end of the environmental friendly graph either. The list is loaded with heavy SUVs that don’t offer either the room or utility of many other SUVs and cannot be recommended by The Car Family in this regard. The good news is that these very expense vehicles are well equipped to tackle any terrain. Other SUV gas-guzzlers are these four-wheel drive models and they have two elements in common. First, they have powerful engines many putting out over 300 horsepower. Secondly, they are loaded with features that the more fuel-efficient models don’t even offer as an option. Look for real life gas mileage under 14 mpg with these rigs. In no particular order in this category are the Toyota Land Cruiser, Lexus LX470, Lincoln Aviator, GMC K1500, Yukon XL, Ford Expedition, Cadillac Escalade, Lincoln Navigator, Dodge Durango, Nissan Armada, Porsche Cayenne Turbo, Infiniti QX 56, Mercedes G, Toyota Sequoia, Volkswagen Tourareg, the quality control bothered Range Rover, and the Chevrolet Suburban. Of these, we find the Toyota Sequoia the best in real life gas mileage situations. We have tested all of these except the ultra expensive G55 and find them all ponderous and fuel hungry. The best handling are the Porsche and Volkswagen with the Porsche having poor quality scores until recently. Not mentioned is the BMW X5 which gets slightly better mileage than the others and is a better handling vehicle than most. However, it has very little storage space. Without doubt the vehicle we fault the most because of its poor gas mileage, you’re going to be lucky to break 12 mpg, is the Hummer H2 with its huge blind spots, high noise levels, and a very questionable handling. In fact, this $52,000 plus block of steel had the lowest ranking of any vehicle after three months of ownership, according to the J.D. Powers study. This was largely due to complaints about its notorious bad gas mileage. I have no idea what these buyers expected, but The Car Family does not recommend this vehicle regardless of where you live. There are far better off-road vehicles. We won’t even mention the military based Hummer because they just are not family transportation based on their long stopping distance, high noise level, lack of storage, limited seating arrangements, and diesel fuel mileage of 8 mpg. Luckily it had two large fuel tanks. We do not recommend SUVs to anyone unless there is a strong need for their heft and traction. However, the best ones in each category for us are the Honda CR-V and Subaru Forester as the most friendly and fuel-efficient. The Ford Escape, Highlander, and the Lexus RX 330 all with V6 engines are excellent. We also suggest you consider the new BMW X3 and Jeep Liberty if you need more serious off-road tendencies and still care about fuel mileage. As for the extreme gas users only the Sequoia is of note and they make one that carries seven people, too. We are currently testing the new Cadillac SRX V8 and find it very powerful and a great ride for the $56,785 price. However, we have not been able to get over 15 mpg in mixed driving. The good news for Cadillac is that we like it much better than the Volkswagen Tourareg and the Cad seats seven, too. We urge you to think carefully before buying a SUV. A fairly loaded Mercedes E Class wagon with room for seven and more cargo space than almost any SUV is rated at 27 mpg on the highway and costs less than the Cadillac Escalade and the all wheel drive Volvo wagons are even less expensive. As for the least desirable SUV from the standpoint of fuel mileage and interior space there is little question that the Hummer creates the heaviest carbon footprint especially when it can only carry five with very limited usable cargo room. For the same price get the Saturn Acadia. When fuel was $1 a gallon the difference between a vehicle that got 10 and one that averaged 20 miles a gallon during normal driving was not going to save you much in fuel perhaps ten dollars a week. With gas prices well over $3 and rising still the difference is a thousand dollars a year. However, even at these high rates research has indicated that people would not be willing to change their driving habits or get rid of inefficient vehicles until the price reached over $5 per gallon. Please remember that these figures are at 10,000 per year. According to studies most Americans are traveling 20,000 miles per year and have commuting times from 30 to 45 minutes daily. If that is the case you can double these costs. In other words, driving a Ford Excursion with gas at $2.50 a gallon is going to set you back about $4000 a year while driving a Toyota Highland is going to save you nearly $2000 and return a much higher resale figure. Honda’s Odyssey was one of our choices as best ten cars in the nation when it first came out a few years ago. It had the new fold into the floor rear seat, a powerful engine, and handled like the Accord sedan it was based on. That was then, this is now. With competition from the all new models out today including the lovely Chrysler van pulling at a consumer’s pocketbook, the Honda appears older in every regard except its superior handling and power.You still get a highly competent van, but the Odyssey lacks the features found in the competition and the useful interior design is drab. For example, the second row passengers still do not have windows that lower and there is not a power option to lift the rear tailgate.Another matter of concern for us was that our test vehicle had over 10,000 miles on it and there was a rattle here and signs of wear there.The engine only got 18 mpg in mixed driving and we never were able to crack the EPA’s 25 mpg estimate for highway driving even with the 3.5-liter, V6, 240-horsepower engine using the standard five-speed automatic transmission with overdrive.On our last test, with a less powerful engine and four-speed automatic transmission, we average nearly 25 in mixed driving so there may be a trade off here with the new powerplant requiring more unleaded to provide more poke.New this year is the availability of leather-upholstery in some models. Although we don’t know why a family van filled with dogs, sharp objects, and kids with pens in their rear pockets would want the leather option. However, the seats are comfortable once you spend the time to get the adjustments correct. Also standard on our EX test van are the antilock 4-wheel disc brakes, traction control, and front side airbags, dual sliding side doors. The van also has available in the EX-L model a rear-seat DVD entertainment system with ceiling-mounted LCD screen, remote control, and wireless headsets. Another option was the GPS system of which Honda has one of the very best. You can’t get this when you order the entertainment centre, though.Mom’s view: We think that the Toyotas’ are more family oriented than the Odyssey, and that the Chrysler has the best ride. Nissan has not made a van available to us.Anyway you slice it, Honda dealers are going to have to try a lot harder to sell the Odyssey than in the past when mark-ups were common. The Car Family does not like mark-ups because, we feel, in the end it hurts customer relations. For example, Subaru dealers used to ask a few thousand over list hot selling WRX sedan. Our daughter wanted one, but she passed because of the mark-up. Instead she got a great deal on a Saab 9-3. Now she is a firm Saab believer and would never think of going back to Subaru. Those dealers lost a potential young, long term customer for a couple of thousand dollars.Getting back to the Odyssey, the bottom line for me is that the Honda, listed for A$49,850 in base form for the more upscale EX, is a significant value. You get air conditioning, antilock brakes, traction control, cruise control, adjustable steering column, power windows, mirrors and door locks, power sliding side doors, automatic climate control, upgraded sound system with a CD player, a keyless remote entry and security system, and alloy wheels. Unfortunately, you need to order leather seats to get the DVD entertainment centre, which I found difficult to understand since they appear mutually exclusive since children are tough on leather.Safety wise, the Honda is a leader in many regards. You have dual front airbags, side-impact airbags, and a three-point seatbelt/shoulder harness for each of the seven seating positions. There are child safety seat anchors for the second and third-row seats. Best of all, the government gave the Odyssey its best ratings for frontal collisions. You also have good visibility to the front and side with your rear vision restricted by the high back window, head rests (which are removable if no one is riding there) and the wide stance of the Honda.But the main reason you buy a mini van is to move people and products. To this end, the Honda is well equipped. The third-row seat folds into the floor, a feature that has been copied by most other companies outside of Chrysler. The best news for me is that when the seat is up you have a handy storage well for groceries and other objects that could tip and roll under seats on other vans. Honda also offers hooks for plastic bags and small cargo nets.The trade off for the floor hidden rear seat is that the spare tire has been placed under the second row passenger seats and is a space saver. The other trade off is that even if you use the provided rear seat pull-up strap to remove the third seat from the floor it requires more leverage and strength a person may have. Please check this out if before you buy because it is not an easy task for some.Loading the van was swift. The low lift-over height is excellent. The power sliding doors are easy to operate and you can close them either with the key or very well placed buttons on the dash.Unlike some vans, the doors stop immediately when they hit an obstruction.I would never order a van without these power doors.I also would have liked it more if Honda had offered a powered rear hatch such as Chrysler does, but as we said at the beginning, Honda’s van lacks many offerings the competition considers important. After driving two cars with this feature, the Chrysler and the Lexus 330 RX, I can tell you from a woman’s point of view that once you get used to power rear deck lids they are irreplaceable.Dad’s view: There was significant wind and tire noise in our test model and I noted that the tires squealed excessively when cornering at average speeds. Thus, the first thing I would do after buying this Odyssey is upgrade the tires. Next, I would spend considerable time learning how to use the column-mounted shifter. If you like to shift for yourself, the strange path that is required by the shift linkage to move it from gear to gear is not intuitive.Driving is pain free. The engine is clearly world class, except for the gas mileage which fell to 16 mpg in town and seldom got to 20 mpg even on the highway. Of course, this is a 4400-pound vehicle with 240 smooth horsepower and so I didn’t expect miracles. Regardless, this is the best handling minivan we have tested. It gets to 100 km (62 mph) in about 8 seconds and can keep pace with the fastest traffic. I would have liked to shift the Honda into fourth gear and leave it there for mountain driving, but this option is not on the shifter.Although in all likelihood Honda is going to put an even more powerful engine in the next version of the Odyssey, the 240 horsepower, 242 pounds of torque that this V6 provides is quite ample, especially once you are moving.Working college aged male’s view: I found that the sound quality from the upscale stereo was inferior as was the radio reception. The unit needs to be replaced if you are into music at all.There was ample backseat cargo and foot room and the seats were reasonably comfortable. The rear bench is too stiff for my liking, and I doubt you could get more than two adults back there without complaint.I did like the idea that you could adjust the rake on the rear seat. The second row buckets also have rake controls and you get your own temperature and fan settings. The rear windows don’t roll down and the small third row windows push out about an inch to provide some air movement.The second row seats can be removed, but they aren’t light so get a buddy. When we had to haul a four by eight foot wood lattice, we just folded the second row seats down and crawled home in cramped comfort.The second-row bucket seats are adjustable fore and aft, allowing optimum comfort for six passengers.Adjustable shoulder belts for the front and second-rows reduce the irritation caused by inflexible mounts that some manufactures offer that ride could choke a small fry, cut into the necks of others, and make pregnant women uncomfortable.Young working woman’s view: It has a nice tight turning radius, holds 20 gallons of fuel, and is easy on the eyes. Yet, my best advise on the Odyssey is to wait. Next year a more potent version well most likely be brought online with substantially more features to keep it competitive. Another advantage of waiting is to see what Ford and Volkswagen are going to offer. Meanwhile, the Odyssey remains the BMW of vans with its sporty combination of handling and performance, although the disc brakes have their pads full when trying to stop this Honda in a hurry.I liked the idea of a fold-up table between the two front seats, but when you stop fast everything slides off. I liked the Chrysler movable centre console better. There is good space in the second row where two-bucket seats can be moved around to make access to the third row of seats easier. The interior is rather plain and certainly not up to the competition’s standards.Would I buy a Honda Odyssey van? Not now. When the need does arise, I would certainly consider this model based on its drivability, but although I like it pricing and value in class, the interior rattles bothered me, as did the tire noise.Family conference: This is a good van with above average reliability and performance. If you can get a good deal, go for it. If not, wait, because this next model year there is going to be plenty of attractive offerings from other manufactures and Honda knows this well. Look for a vastly improved model to arrive and move the bar even higher in the expanding mini-van market. One thing we hope Honda does not change is its value pricing. For a list of all vehicle websites go to http://www.reacheverychild.com and click on business. You smile when you see a Volkswagen Beetle, you grin at a Chrysler PT Cruiser, but you openly laugh when you see the new Toyota Scion xB because, in a word, it looks like a Tonka toy. There is no question you are either going to love or hate this station wagon, but regardless, it is going to sell well. The reason is simple, it is priced well and has a very useful design and most people are going to take pleasure in the attention. Did we enjoy our stay with the Scion? You bet, but it wasn’t because of the looks or the fact drivers tried to push us around with their larger vehicles—and everyone is driving a larger vehicle. The reason we found it attractive, figuratively speaking, was because you get a lot of vehicle for the money. For despite its diminutive looks, you can get four, maybe five good-sized adults onboard and have room for a few pieces of soft luggage to boot, literally. If you watch you option list you can be driving this Scion for $14,200 and get over 30 mpg and we strongly believe, excellent resale. In other words, Toyota has another winner in its stable, and this one is going to delight the all-new Scion dealer network because this little rig is a blank canvas waiting for some creative options. For example, Toyota lists as options some of the most unconventional items we have ever seen. You can load you Scion with illuminated cupholders, LED interior lights, bazooka tube subwoofer, satellite radio, carbon-fiber fuel door cover, special shift knob, cargo tote, sport pedal covers, mud guards, door sill enhancement B-pillar appliqué, and a rear spoiler to mention just a few. Add essentials such as curtain side airbags and front side airbags, remote keyless entry, and alloy wheels and you can pretty much be assured you are going to own an exclusive looking mass produced vehicle. Of course, if you order all those the list price is going to be at $20,000 so be judicious. All told there are about 40 options for the xB and Scion is said have a no haggle policy so what you read it what you pay. Some cavets when ordering the optional big subwoofer, it takes up a lot of storage room. In addition, the stereo reception is poor unless you get the satellite option, which is worth it. Mom’s view: We tested the automatic transmission xB and found it plenty spunky at first thanks to the small tires and light weight. However, once the Scion is over 4000 rpm the acceleration ends and the engine groans and its time to think seriously about visiting your local tuner shop. We stopped at Autolinks Motorworks, 4961 Santa Anita Blvd, in San Gabriel, Calif. and were told even the more normal looking xA has drawn a barrage of customizers. Despite the options, what I liked were the standard features. The xB comes with ABS; air conditioning; power windows, locks, mirrors and steering; a six-speaker Pioneer stereo with a CD player; a 60/40-split folding and removable rear seat; keyless entry; a rear wiper; rear defroster; a tachometer; and a ground effects kit as well as airbags. What I didn’t like was its size. It is ten inches shorter than a Toyota Echo and people feel that since the Scion is small they can just shove you around in traffic. I used the horn extensively to no avail. I would pay extra for a louder horn. In fact, an air horn mounted on the roof would probably look great and give the bullies a clear message that they don’t own the road. Luckily, the Scion handles and stops quite well. And it comes well-equipped with active safety features: antilock brakes (ABS) with Brake Assist (which increases braking pressure in emergency situations) and Electronic Brake-force Distribution (which apportions braking force to the tires with the most traction); Vehicle Stability Control (which attempts to restrain a vehicle from spinning out of control by adjusting the application of throttle and brakes); and traction control. There were a variety of storage areas inside, including the usual glove box, and map pockets, and trays under the dash. What bothered me the most was the lack of good rear interior lighting when you were searching for dark items you dropped. Maybe this car is designed for younger eyes, but a more powerful interior lighting system wouldn’t hurt. Overall, I liked the Scion and would recommend it to those who find its styling attractive. For a few dollars a month more I would prefer a more modest looking station wagon from Subaru or Volkswagen, but I would miss the attention the Toyota brings. A real plus is that I never felt I was driving a small car. The Scion needs more power if it is equipped with an automatic transmission. The 1.5-liter inline four-cylinder engine has variable valve timing, but runs out of gusto after 4000 rpm. It’s the same engine used in the Toyota Echo and creates 108 horsepower which is fine in city driving, but when passing or accelerating you need to plan ahead even thought the Scion weighs just 2340 and has 105 foot pounds of torque. You can drive this Scion hard. It rides smoothly and is effortless to drive with good brakes. It’s no hot rod, however, so shifting into lower gears is needed for quick acceleration. Inside, it’s roomy and has a nice interior with controls that are easy to operate. The driver and passengers sit upright in chair-like seats and benefit from excellent visibility. As its looks suggest, the xB offers better cargo capacity than your average compact car. Young working female’s view: This is a tall fellow. Its over 64 inches tall and offers an extremely roomy interior. It is uncomplicated to fit in a baby seat, don’t worry dad, and if you fold the rear seats down you have yourself 43 cubic feet of room. Forget the subwoofer if you want to haul things because it is placed right in the middle of the rear storage area. In terms of appearance, there is little question this is a price leader. The interior is youthful and I found it very difficult to read the center-mounted gauges because of the poor lighting and the small numbers for the tach and fuel indicator. With an 11.9-gallon gas tank, you can go 300 miles, but we won’t try any more. I averaged about 28 mpg in mixed driving. You can order the Scion with either an automatic-transmission or manual transmission, expect 0 to 60 mph speeds around ten seconds. However, with the gas pedal rigged to provide a lot of acceleration initially you feel you are moving faster. It does not take long to figure out that the feeling of speed quickly evaporates after 30 mph. Still, this is excellent for commuting, but not so hot for high speed passing. There is no way that I would consider the Scion. Although the price is attractive, I would rather have the new Toyota Solara and drive a car that exhibits the appearance I want to display for the driving public. Young working male’s view: I hope you got a chance to hear me at the House of Blues. Anyway, this is not my type of vehicle for only one reason, it is too trendy. I do appreciate what you get for the money. The car runs great and, except for the usual short wheelbase roughness over banged up pavement and low bidder highway potholes, the chassis does its job exceptionally well. If you want his car to handle better, the tires and rims need to be changed. I enjoyed driving the car and listening to CDs with the optional stereo and elaborate speaker system. But the radio reception was sub par except for the satellite stations which are worth the $10 a month extra fee. Big trucks and side winds definitely alter your driving style as the square sides and lightweight conspire to make you well aware that you are piloting a small car. The good news here is that the Scion’s narrow stance leaves plenty of extra room in the lane so the gusts are unproblematic to compensate for. The steering was very good; the brakes more than up to the task, and the interior surprisingly quiet. You have the feeling you are sitting high in seats that are a bit thin in the padding department. Visibility was well above average and driving in heavy traffic was only a problem when some large SUV was tailgating. I learned not to worry and just turned up the stereo and admired Toyota’s creativity. Family conference: Scion plans on bringing out a coupe and perhaps a sedan later, but in the meantime, if the xB appeals to your sense of aesthetics we recommend you drive and buy soon because this is going to be a hit in some areas. What it is going to be like driving in the snow is another matter with its small tires and low ride height. Perhaps, in a few years, the Scion will come out with all wheel drive and it might appeal more to the snowbound. Regardless, this is a good vehicle, and a valuable one at the suggested base price. We would like to see the crash test results first, but we are sure that Toyota has we spent a bundle to make sure the Scion is tough since a poor scores would be the only element that would hinder sales. On the other hand you might want to wait until next year when a new, not so squared off version arrives. For all vehicle websites go to http://www.reacheverychild.com and click on business.